Xiaomi Mi Note: This Chinese Phone Is Great. Too Bad You Can't Use It. 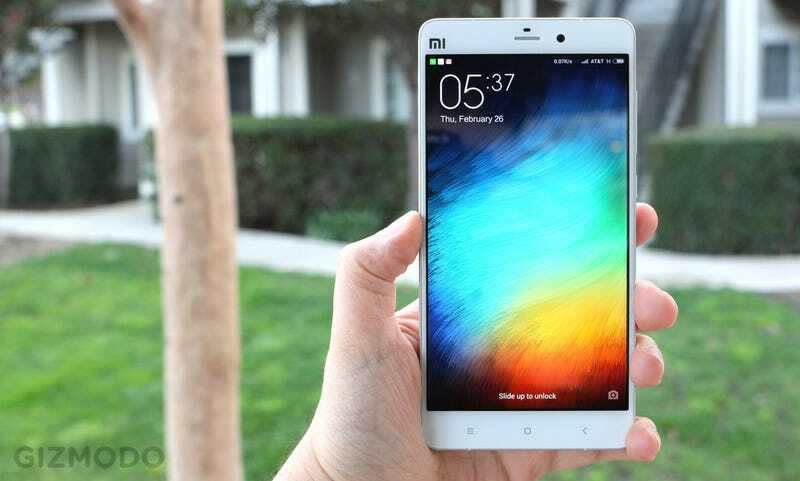 You've probably never heard of the Xiaomi Mi Note. You can't buy one in the US. You should read this story anyhow. It's about a smartphone—a really good smartphone—but it's also about the future of personal electronics. You care about the future, no? Because years from now, we may look back at this phone as the first proof that China can build world-class products. I don't think I'm exaggerating when I say this could be a pivotal moment in cultural history. Just ask anybody who's lived long enough: "Made in Japan" used to mean cheap crap. Personally, I don't remember those days. By the time I was a kid, companies like Sony had changed people's perceptions of Japan forever. I wanted a Walkman so bad I could taste it. I'm willing to bet that my kids won't remember when "Made in China" had a negative connotation. If the phone in my hand is any indication, they might be lusting after a Xiaomi. Sure, I'm oversimplifying things a bit. After all, who do you think produces all those Apple iPhones, if not Chinese factories? And if Samsung, LG, Asus and HTC from neighboring Korea and Taiwan can find a welcome in America, why not Xiaomi as well? But there's still a certain stigma around China's own brands, like Huawei and ZTE. I'll admit I was skeptical at first. Then, I picked up the Xiaomi Mi Note. A few days later, I have no idea what I was thinking. At the Chinese equivalent of just $370 off-contract—compare to $600 for a Samsung Galaxy S5, or $750 for a iPhone 6 Plus—the Mi Note defied the stigma from the moment I pulled it out of the box. For starts, there's barely a hint of plastic in this phone. It's completely crafted out of glass and metal, a beautifully beveled aluminum band joining two panes of delightfully curved Gorilla Glass that form the front and back of the Mi Note. Yes, it definitely evokes an iPhone, but to me this 5.7-inch handset actually feels better in the hand than an iPhone 6 Plus. The curved glass back and beveled edges nestle into my hands in a way that the iPhone's slippery aluminum never could. And the screen—made in Japan, by the way—is nearly as gorgeous. Sure, it's only a 1080p panel in a world where Android handsets are pushing 2K screens, but so is the iPhone. And like that iPhone display, this screen is sharp as heck and the colors really pop. It doesn't get quite as bright as I'd like outdoors, but it also doesn't catch as much glare as many other phones. You want specs? In China, your $370 will buy you competitive ones: a quad-core 2.5Ghz Snapdragon 801 processor, 3GB of RAM, 16GB of storage, LTE, micro-SIM and nano-SIM slots for two different carriers if you like, and a 13-megapixel Sony camera that's pretty damn great. It's the same exact Sony sensor you'll find in the $300 OnePlus One, another Chinese phone lauded for surprisingly good specs and smartphone image quality. But trust me when I say that I'd pay an extra $70 for this phone instead. For one thing, the screen is way better. Pictures look great while you're taking them and when you view them on the phone itself, not only after you transfer them to a PC. The most surprising part—the part I can't believe I'm telling you—is that Xiaomi's own version of Android is pretty amazing too. Where every OEM has tried and failed to make people love the software they pile on top of Android, I could see myself using this OS. Yes, it tries to replace Google's excellent Gmail and Chrome Browser and Calendar and Play Store and more with apps of its own, but that makes a certain degree of sense. (Google services are banned in China.) And unlike, say, an Amazon Fire tablet, you can still use those Google Apps if you want. They were all right here waiting for me. More importantly, Xiaomi's MIUI actually improves on Android in ways I never dreamed. I'm not talking about the basic homescreen interface, which looks a lot like the iPhone with its carefully spaced out icons and lack of an app drawer. (I want my app drawer.) And I'm not talking about the way the Mi Note's front-facing camera can automatically "beautify" your face by erasing all your pores. I'm talking about the built-in ability to record both sides of any phone call by pressing a single button. I'm talking about—right in my notifications shade—seeing just how many of my precious kilobytes of mobile data are being used in real time. I'm talking about the ability to decide—on a per-app basis—which apps deserve to send me notifications and which ones I can totally avoid. Or a one-handed mode that shrinks the size of the entire phone's screen down to manageable proportions... though sadly requires a gesture to activate that's impractical with one hand alone. I'm talking about super simple yet intelligent, no-brainer features like asking me (when I plug the phone into my PC) whether I want to transfer pictures or files—and a single tap to switch between them—rather than if I want to mount my phone as a "camera" or as a "media device." I suppose I've only used the Mi Note as my primary phone for a few days now, but the software keeps surprising me with how simple, intuitive, and (dare I say) beautiful it can be. It doesn't feel bloated or weighed down like Samsung's TouchWiz or HTC Sense or the other skins that always drive me to always pick stock or near-stock Android phones instead. I still don't know if I'd personally pick MIUI over Android Lollipop, mind you. I really miss the ability to pull down on notifications to expand them and see my individual email subject lines instead of a generic "You have 17 new messages." But the fact that we're talking about personal preference shows you just how far Xiaomi has shifted the conversation. The Mi Note is a high-end smartphone through and through. One that can not only stand proudly alongside the competition, but teach them a thing or two. And one that makes you wonder when Xiaomi will bring its phones to the United States. The answer to that is complicated. They might not come at all. The US is a complicated cellular market where—to be successful—you generally need to be prominently featured on cellular carrier's shelves. Carrier subsidies ("Get your phone for just $99 on contract!") make it tough to sell devices that compete on price, because a $99-on-contract phone seems cheaper than a $300 unlocked one. Add to that Xiaomi's lack of brand recognition, need for FCC approvals, and some possible legal threats, and Xiaomi admits the US isn't particularly fertile ground. But that hasn't stopped Xiaomi launching some non-phone products in the US to feel us out. Xiaomi's Mi Headphones. Not bad for $110! This isn't a true review of the Mi Note—not exactly. The device I'm holding isn't compatible with LTE here in the United States, which means I can't really tell whether it'd work as my daily driver over the long haul. I can't conduct a proper battery test over 3G, though the 3000mAh battery definitely seems to hold a charge. I can't get the weekly updates that every phone in China gets—part of Xiaomi's super cool business model I don't have room to discuss! I also understand this isn't the final software for this device, which could explain why the camera's image stabilization is so jittery, and a couple other glitches I saw. But I want it to happen. I want Xiaomi to show those other companies up. It seems almost fitting right now. Sony once showed that Japan could produce truly great products. (Sony is abdicating its shrinking throne.) Now, a company like Xiaomi could do the same for China.